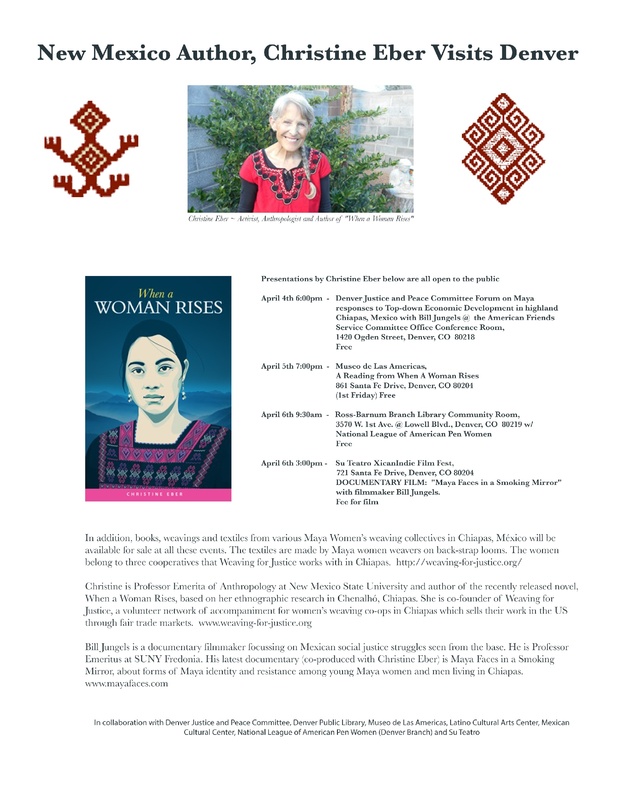 Christine Eber ~ Activist, Anthropologist and Author of “When a Woman Rises” will grace Denver with her presentations and book readings below which are all open to the public. Also, Bill Jungels, documentary filmmaker and producer of Maya Faces in A Smoking Mirror will present at the DJPC Forum and will attend the following events below. The documentary, Maya Faces in A Smoking Mirror, Co-Produced by Eber was the winner of the 2018 Best Feature Length Documentary at the Las Cruces International Film Festival. 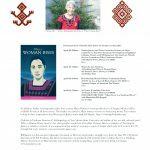 In addition, weavings and textiles from various Maya Women’s weaving collectives in Chiapas, México will be available for sale at all these events. 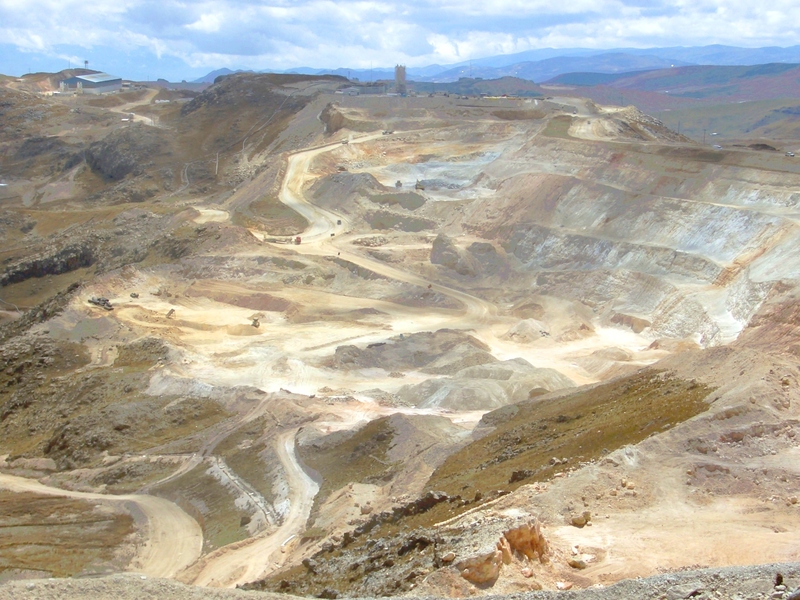 In the novel, “When A Woman Rises”, Magdalena from Chenalhó, Chiapas tells the story of her best friend Lucia who has been missing for ten years. Magdalena recounts how as children they dreamed of going on in school after primary school and how as adults they faced the challenges of poverty, racism, and rigid gender roles. Both women eventually join the Zapatista movement and struggle to reconcile the many demands on them as kinswomen and community organizers. Eber’s other books include: Pasar Bien Por La Tierra: El Tejido de Vida de Una Mujer Maya-Tzotzil de Chiapas, México/The Journey of a Tzotzil-Maya Woman of Chiapas, México: Pass Well Over the Earth—Co-authored with “Antonia.” (University of Texas Press), Agua de Esperanza/Agua de Pesar/Mujeres y Alcohol En Un Pueblo Maya de Los Altos de Chiapas (CIRMA—Centro de Investigaciones de Mesoamerica and Plumsock Mesoamerian Studies, Vermont), Women and Alcohol in A Highland Maya Town: Water of Hope, Water of Sorrow, University of Texas Press (Women of Chiapas, Making History in Times of Struggle and Hope, Co-edited with Christine Kovic, (Routledge), and Just Momma and Me (Lollpop Power). If you can’t “Build”, sponsor someone who can!